I hope it is ok to post here. I recently developed a quantizer with user selectable scales as a DIY kit for the eurorack format. Notes can be selected with the duocolor LED buttons and it is either free running (no cable plugged into the trigger in jack) or externally triggered (cable attached). Whenever the output changes a trigger is generated.It uses a proper DAC for CV output, so no PWM is used. 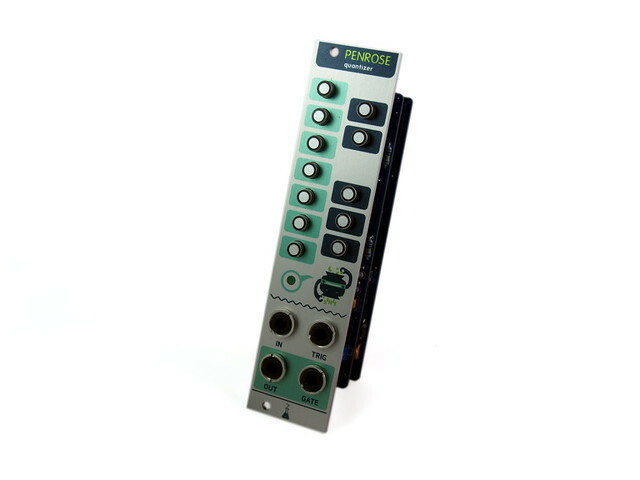 I actually found the Penrose Quantizer on ModularGrid only yesterday and added it to my GearLust Rack. Any plans to produce this as a completed module 'cause I'm decidedly dodgy at DIY? Will any shops in the U.S. have them? I can build these in the US for anyone that needs one. i just got mine in the mail.. thanks for the nice presents!! btw: that small bottle with the wooden cap, where did you got it from? my girlfriend wants to use such bottles for a food / oil project. received mine today - including some obscene candy. fast build, because of the excellent manual. calibration was fast too, maybe i'll redo it with a scope, but for now a multimeter worked fine. The buttons are very beautiful! very cool solution for the pcb / panel mounting also!! I would also be willing to build for people in the US if altitude becomes too busy! I just build and tested the Penrose i ordered last week. There's 3 light buttons (G#, A#, B) that does not light but are working. I checked my soldering and it looks like everything is ok. I thought also to update the firmware but couldn't find the audio file to do it, on the site. Does anyone have the same issues? Any solutions or check i can do? Did you make sure to follow instructions which way to put the button pins in ? I received an answer from Julian by mail. It's apparently a defect 10 Ohm resistance. I like the look of this module. Could one of the people who picked it chime in on the panel quality? Is it hand made (like the befaco ones, I hope not) or nice and cleanly manufactured? Really love the idea of the trigger out on pitch change, I wish the uscale had that. If the panels are nice I'll be ordering. BTW - latest module I built from them (Even VCO) was very much improved, using aluminium PCB material. But still not as nice as others (grayscale, MI, MTM etc). I understand they're still looking to improve their panels. Good to hear- I like their modules, but the panels are a huge turnoff. I did just order the sampling modulator kit... fingers crossed for a nice panel. So the selectable scales are not presets but one has to program the scales using the minikeyboard? And I am correct that there is no transpose or similar? Could the mini keys be used as a, well, mini keyboard, when nothing is plugged in? That would be a useful feature (have been looking for something like this). I got my kit a couple of days ago. Panel is really nice. Seems to be an emerging wiggling practice to give toys with the kit. Nice. A packet of camel balls and a jar to keep your oil (been years since I've come across any oil, mind you). Since I ordered it, my circumstances/requirements have changed so I'll either trade it or build it and trade it. Cool module though. Mightily impressed. have a look for "Fimo bottle"
Lots of different varieties available. The panels are quality aluminum panels with sub anodized (is this the right term?)printing. Similar to the Mutable panels. So the selectable scales are not presets but one has to program the scales using the minikeyboard? And I am correct that there is no transpose or similar? Could the mini keys be used as a, well, mini keyboard, when nothing is plugged in? That would be a useful feature (have been looking for something like this). Sorry, no transpose. About the mini keyboard use - I'm afraid there are no free pins on the microcontroller left an the CV in jack has no switch wired up to detect if a jack is plugged in.